As cancer continues its seemingly relentless march as one of the leading causes of fatalities around the globe, Grenada is no exception. Thus, the need for increased urgency and determination which are required for the ongoing challenge of raising funds for both awareness and medical intervention to fight this killer, which is no respecter of gender, age or lifestyle. This disease knows no bounds and therefore does not allow for any respite in the battle against it. 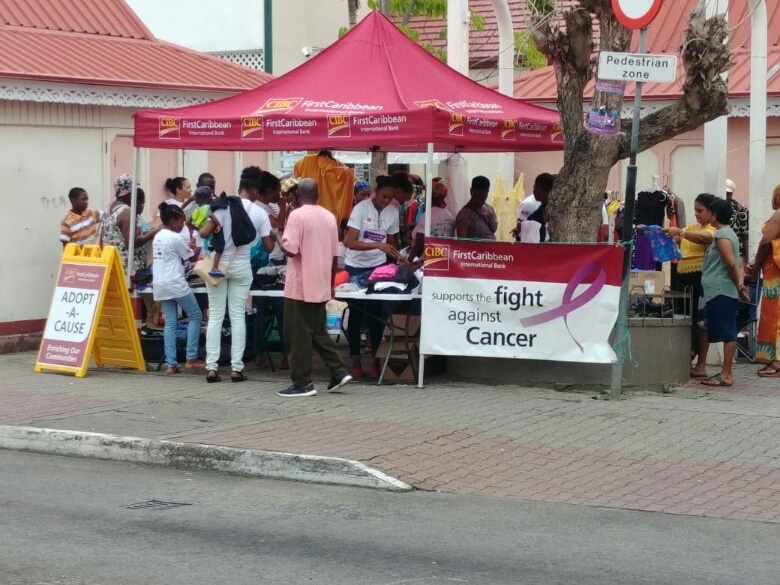 With this at the forefront of their minds the CIBC FirstCaribbean team spends not just a month or two, but the entire year fundraising culminating in their final push during the annual Walk For The Cure. The management and staff have collectively been engaged in numerous fundraising activities in an effort to realise even more funds for the initiative, in advance of the sea of T-shirts and numerous participants who will walk with them through the parish of St George, in a show of support. Grenada’s efforts throughout 2018 have included 2 jumble sales, where staff contributed clothes, shoes, trinkets etc. and set up at 5.30 am in the towns of St George and Grenville to get the fundraising underway. Along with cupcake and fruit bowl sales, a weekly ‘pay to wear your jeans to work day’, a take-away tea and even a bow tie and lipstick Friday! The combination of these activities and the sponsorship donations of the corporate community have already raised approximately $39,500, just short of 2017’s final total of $41,000. With such encouraging numbers, Grenada looks forward to exceeding last year’s performance by the close of the 2018 Walk for the Cure. CIBC FirstCaribbean 2018 Walk for the Cure is to take place on Saturday, 13 October 2018 at 5 pm departing from the Morne Rouge playing field.